It's no secret that Oregon's Willamette Valley produces a world-class bounty of resources. Pioneers ventured to the Willamette Valley, known as the "promised land" during the Oregon Trail in the 1800s. Then, an influx of experiential travelers and millennial foodies rediscovered the beauty and abundance of the Willamette Valley when it became the "it" destination in every magazine from Bon Appétit to Travel & Leisure nearly two centuries later. Tucked between the Oregon Coast Range and the Cascade Range, the Willamette Valley stretches 150-miles along the length of the state. Mild year-round temperatures, plenty of rain, as well as easy access to the Willamette River and its tributaries, make for a bountiful harvest every year. Here, you'll find rolling farm lands of Christmas trees, hazelnuts, apples, prized Pinot grapes making for the best Pinot noir wines in the world, pears, pumpkins, world-reknowned hops for Oregon's many craft breweries, and the list goes on. It's from these Willamette Valley farms that Portland's many critically acclaimed restaurants create local, sustainable, and delicious meals. This October, in order to travel back to the source, I packed up my Herschel Supply Co. Heritage backpack with my favorite Naked Juices and headed out to a few of my favorite family-owned farms and local markets that highlight the bounty of Fall harvest here in Oregon. If there is one place in Portland to see the bounty of the Willamette Valley, it's the PSU Farmers Market. Year-round, farmers, bakers, and artisans gather to sell their goods in the South Park Blocks located at Portland State University. It’s a go-to Saturday activity for Portlanders looking to pick up farm fresh produce from over 200 vendors while supporting the local community. Between bustling acres including pumpkin patches, apple orchards, a fresh apple cider press, as well as hay and corn mazes, family-run Bauman Farms has it all when it comes to celebrating the fall harvest. A large store also features all kinds of fresh pies, goods and produce from the farm. Whatever you do, don't skip the cinnamon sugar apple cider donuts or the fresh pressed apple cider. The Bauman Farms Harvest Festival continues until October 31st. Sixth generation family-owned and operated Jones Farm is located on River Road, just outside of Salem. This sweet farm stand offers an abundance of fresh produce at affordable prices without the crowds. The beautiful pears, apples, and handmade pies are all treats to take home. This farm is one of my favorite spots on the country backroads when headed North to Portland. 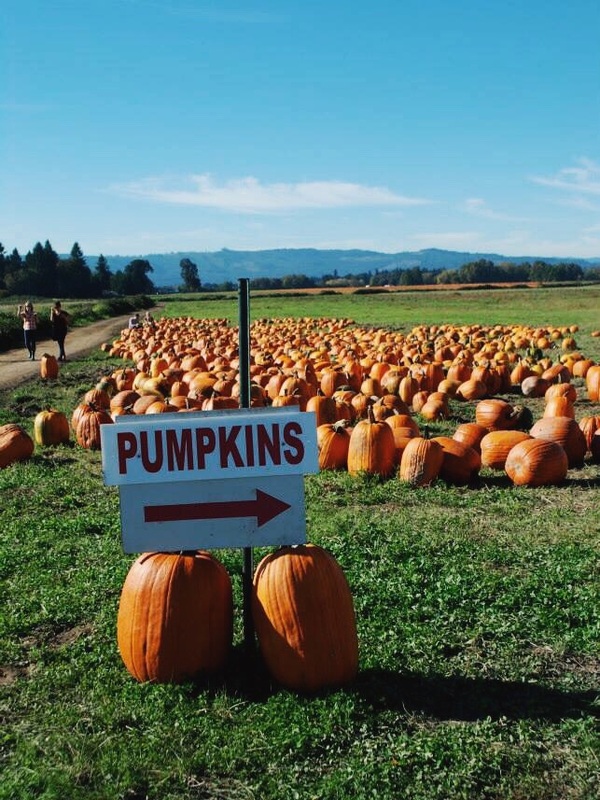 Located on Sauvie's Island, Bella Organic Farms showcases over 70 varieties of certified organic fruits, vegetables, pumpkins and more just a 20-minute drive away from downtown Portland. The farm is also 100% solar powered. The seasonal corn mazes, both traditional and haunted, offer a fun activity for both kids... and adults pretending be kids again. If you've been following this year's Iconic Oregon Adventures fueled by Naked Juice, you may have read in August about the Drink Good Do Good campaign. This summer, Naked Juice partnered with Wholesome Wave — an organization that helps create affordable access to fresh, local and regional food to those in need. For every social media post with ‪#‎DrinkGoodDoGood‬and ‪#‎NakedJuice‬, Naked Juice donated the monetary equivalent of 10 lbs of produce to Wholesome Wave. And guess what? The Drink Good Do Good campaign donated $500,000 worth of produce! In a place as bountiful as Oregon, no one should go hungry due to lack of resources.